I have an old, trusty ViewSonic PF790 monitor that I use at home. I first noticed that it was a bit out of whack when I posted this photos of Marissa. On the ViewSonic both team's jerseys look RED. On every other monitor, it is clear that Marissa's team is Orange and the Jester's are Red. Today it has gotten much worse - it is not keeping synced and now the greens and blues are way out of whack. I may have to disconnect its feeding tube and spare it of the slow demise that is sure to come. Very sad. It has been a loyal servant. Then again, its a good opportunity to upgrade to one of them newfangled fancy flat panel displays!! Today I was supposed to hook up with Runner-Girl for lunch. Sadly she had a crisis in the data center as they are probably not using BMC's excellent BSM solutions ;-). She had to cancel our meeting. So, I figured if ya can't have lunch with the Korean, then at least have a Korean lunch. So I walked over to Cathy's Wok and ordered a huge bowl of Sa Ma Noodle Soup (or is it Tsa Ma??). Anyway, the soup was absolutely fabulous with big pieces of scallop, shrimp, crab, pork, along with the secret Sa Ma Sauce. Wow, Five Stars! Joe Bob says check it out. The relationship between product developers and the quality assurance team members can occasionally be a stressful one. The manager’s goal is to balance the inherent friction that exists between the groups with effective teamsmanship and leadership such that the whole team excels in getting quality software out the door. Hmmm...I have not had a report card this bad since High School! Acckkk! Unreal. Just shoot me. Please. Marissa was supposed to play at 0800 this morning in the Spring Classic Soccer Tournament. I had previous plans to run with McGehee at 0630, but I really needed to get out earlier than that in order to make the game. So I canceled the plan with McGehee and instead decided to head out sometime after 5 for a loop through Breckinridge and Firewheel. I woke up shortly after 5. Lightning was flashing outside as a front was moving through. No problem I thought, the storm will blow through, then I'll head out. At 0530 the storm had cleared, so I got up got dressed, then just for good measure I checked the Dallas Radar (left). There was a nasty storm cell heading straight for my area - probably 45 minutes away. That did not bode well for my planned 90 minute jaunt. So I climbed back into bed and 45 minutes later the storms were indeed raging outside. Fran was up at 0700 trying to figure out what was going on with the Marissa's Tournament. Soon I got the word that the games were delayed until at least 10. I got up around 0800; it was still raining but soon it stopped again. I went back and checked the radar and it looked like there was a window to get a run in. There was another cell heading our direction, but it looked like it might be 90 minutes away. Around the same time Fran got the word that the games were delayed until noon. Shortly before 0900 I headed out. It was still drizzling a little bit but not too bad, when I headed out. I hit Breckinridge and was halfway through the park when I heard the north Lightning warning station sound. I was right underneath the south warning station. It never went off. In fact, in the three times that I have heard the north station sound, never has the south station joined in. That makes me wonder if one of them is defective. Firewheel was apparently closed which made it really nice to run the golf course! About an hour into the run, the rain started to pick up. When I got back to Breckinridge I could hear the damned North lightning alarm. And once more the south alarm was still silent. Then I saw another runner, in fact we had passed each other an hour earlier - Its good to see some other hard-core runners out here. When I finally was able to see the North lightning alarm - I noticed that in spite of the horns, the lights were not flashing. That damn alarm is definitely screwed up! There was no one from the Spring Classic on the fields at Breckinridge. It was raining hard, and there was LOTS of water on the fields. I knew right then that the tournament would be canceled. Sure enough an hour later we got words to that effect. It was a good run; I was about a half mile longer for 90 minutes than the last time I ran this loop. I'm three weeks behind in my running logs - but when I get around to dumping my Polar, I'll post the HR profile. Major thunderstorms rolled through Dallas this morning. As a result the second day of the tournament was canceled. According to the standings, Marissa's team finished third in their division and tied for fourth overall (out of eight teams). Today Marissa's team played two games in the Dallas Cup Spring Classic. The event is held at Breckinridge Park which is right around the corner from the homestead. Marissa's club, the Longhorns are a sponsor for the event, too. Marissa's first game was against Sting. 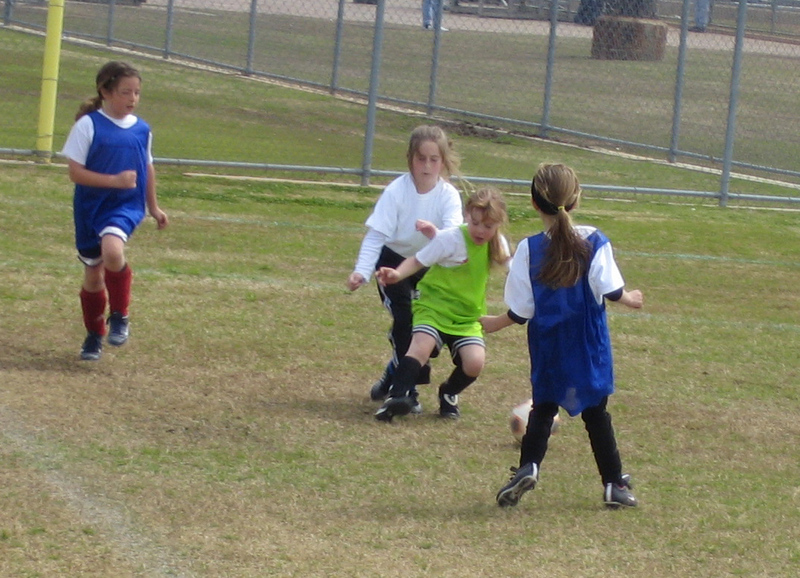 Three of the Sting girls had previously played with Marissa last year at FC Dallas. Their goalie was the girl who broke Marissa's arm last summer. Marissa's team drew first blood early in the first half. They held until late in the first half, when Sting Stung. In the second half, Marissa got a jump on their defender, but lost the ball to the evil Sting keeper. The Horns played tough until very late in the second half, when Hanna, one of the other girls that Marissa played with, put the ball in the net. Final Score - Horns 1, Sting -2. 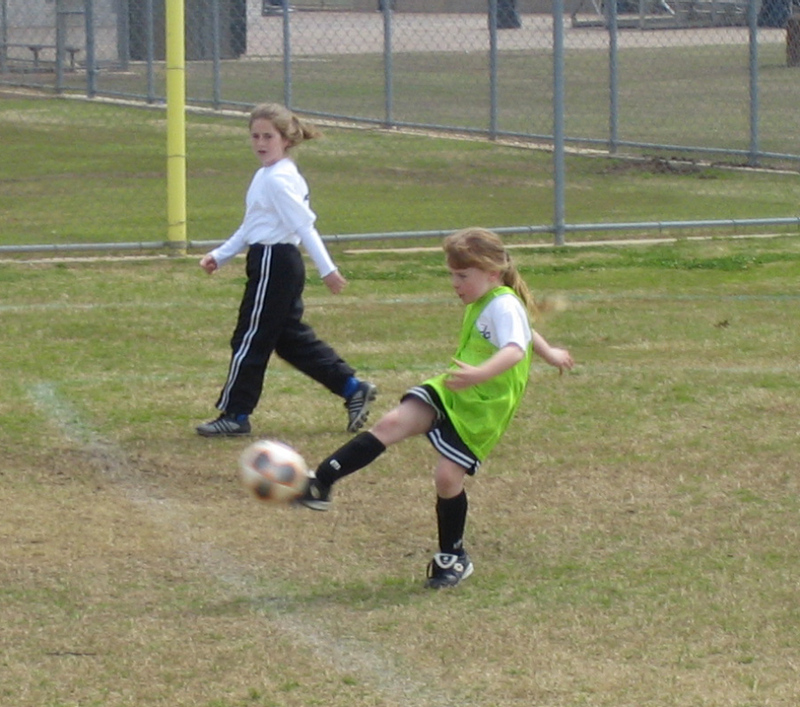 We had to wait two hours for game 2, which was against Granbury United. The Horns jumped to a 1-0 lead early. And just as against Sting, they held that until late in the first half. It was tied 1-1 at the half. The Horns came out strong in the second half and went up 2-1, and then five minutes later added an insurance goal. Marissa played hard and was instrumental in several key attacks. Final Score was Horns 3, Granbury United 1. Tomorrow Marissa will have two more games. The first one is against Andromeda (Logan's Club) and a team coached by Marissa's old FC Dallas coach. She will know several players on that team as well. Then they will play a second game against Texas Spirit. I'll take some photos tomorrow. Now that the Cats are done here are a few additional thoughts. The Cats have played in four NCAA games in the last three years. All of those games were against National Champions. First was against Arizona, then the defending champion. Then UConn, who went on win the championship that year. Then Syracuse, champion two years ago. Finally Michigan State, the 2000 champions. Sheesh! On top of that over the last two years, the Cats also traveled to UCLA, Carolina and Nevada. Footnote: Ben and Jerry's have created a new flavor in honor of Tom Brennan - RetireMint. Check out the excellent piece by Andy Katz. The City of Richardson has some wonderful photos of Breckinridge Park. Interestingly, they do not include the Coyote that crossed my path there on Saturday morning. Nor do they include photos of Lightning Detection System that scared the beejezus outta me when I was running there this morning. Luckily the Coyote was more scared of me than I of him. And in spite of the horns and flashing lights, the Good Lord decided not to strike me down during my intervals this morning with a bolt of lightning. Although He did determine that a good soaking was in order. In kind of a weird quirk of fate, Marissa's team was playing against the same club that Logan's team played yesterday. Unlike Logan's team, Marissa's team drew first blood. They played well and the score at the half was 1-0. United got a lucky goal early in the second half and both teams played well for the remainder. Marissa played aggressively at forward. The Celebrity Winterfest is the largest fund raising event for the Special Olympics of Northern California and Nevada. As previously noted, I qualified for the BMC 'A' Team after after having not been on skis for two years. Last year this team finished third so the pressure was on to perform. Each corporate team was consisted of eight team members plus one celebrity and one special olympic athlete. Our celebrity was Mark Moses, from Desparete Housewives. Our athlete was a downs kid named Devin. The race course was in a dual GS setup. Each team member would do one run on each course. The combined times from the first two runs would determine the top four teams, who would qualify for the finals. There would be one run in the finals to determine the top teams. The total team time for each run is the sum of the fastest eight racers. The last two times are thrown out. I had qualified seventh on my team. The top two skiers on our team are in different league. I had thought with practice I could beat the rest of them. We were the first team down the hill and it was 'icy'. After the first round we were in third, eight seconds out of first and 2 seconds out of second. And, I had the third best time on my team! Yea! The snow had softened considerably for our second run. We had the second best run on the second run - we were 17/100's behind the Special Olympics Board of Directors team. That also put us in second place over all. We had qualified for the finals! For the finals we were staged against the Cingular team, who were in third. The racer that I was against had posted a time a full second better than mine on the second run. I let him get out of the gate first, then I focused on running a smooth fast run. About halfway down I realized that he was out in front of me. I was catching up though. I ran the last three gates perfectly and caught him at the line. Awesome! Marissa started skiing when she was three. Alta would not let her in a group lesson so we hired 'Bob' for a half day lesson. Marissa loved it and Bob determined that the group lessons would be no problem. For years all we heard about was Bob the ski instructor. He really made an impression. On our first day skiing just before noon, I saw Marissa as I was riding up the Comet Chair. It looked like Marissa was heading in for lunch so I headed down to the lodge to see what they were up to. Sure enough I found Marissa waiting for lunch. Marissa had one boy in her class and their instructor, Hagen reported that there were doing really well. They would not let Marissa use polls, and boy was this a sore subject with her. Hagen said he would give her poles for day two - so that made her happy! I made arrangements with Hagen to meet Marissa at the end of the day at the top of the gondola. That evening Marissa and I skied Liz's, a very challenging blue run. Marissa skied very carefully, carving turns all the way down. I did not see Marissa on day two until the end of the day. She had a different boy in her class and Hagen was still her instructor. Hagen reported that Marissa had been working on speed and small bumps that day. We decided to do repeat runs off the Tamarack lift. There are two moderate blues, not as hard as Liz's that are serviced by this lift. Marissa was more aggressive than on Wednesday, but was still skiing pretty conservatively. There was a long flat spot at the end of the run to the base of the lift. I told Marissa to get into a full tuck to pick up enough speed to get the lift. There was also a big bump at the base of the hill, so when I demonstrated this, I popped some big air off the bump. Marissa practiced this several times, and I think that this was a defining moment in Marissa's ski career. Again I did not see Marissa on the hill Friday until I picked up at the end of the day. Hagen reported that they had skied some black runs that day, and they worked on skiing bumps and "connecting short radius turns in the steeps!" Marissa and I headed to the runs off of Tamarack once more. There was a big mound where the lift dumped at the top of the hill. It was a blind drop to a connecting trail, so I always skied around it. Marissa just blasted right over the top and hit a big hockey stop with a BIG GRIN. Then Marissa blasted down the hill, really fast. This was a change for sure. On our second run, Marissa did the same thing over the mound, but she got a little off balance and took a nice face plant and tumble. But she came up grinning. The photo to the left was taken just before the spill. Marissa was really carving her turns, skiing fast, and eating up the bumps. In this photo she is demonstrating good form and balance, she has her outside ski on edge and is moving her inside ski to set up her next turn. Hands forward. Awesome! Bob has been officially retired as Marissa's ski idol. I have a feeling that I will be hearing alot about Hagen from now on! Today Logan's team posted their first loss of the season. The girls gave up two goals in the first the half. The second half, they looked sharper. I think they may have been suffering from SpringBrakeItis during the first half. Logan played defender for the first half, and then she switched to Goalie for the second half. She usually plays Goalie for just a quarter, but Coach Don kept her in there for both quarters. And as noted, Logan picked up the shutout for her half in Goal! Tom Brennan had 300 wins; 4 - 20 win seasons; 3 trips to the NCAAs. Brennan is supposed to retire after this season. Before today he had never won an NCAA game. Today the Cats gave him his wish - a big win over the Orange People. Logan first skied at Taos when she was two. I put her on skis, dragged her up the lift and skied her down between my legs. She loved that. She had lessons at Whistler and Blackcomb when she was three and four. We missed skiing last year when she was five. "Logan is an awesome skier with a great attitude. She progressed very quickly and picked up new skills as if she was born to ski. [ed: of course she was born to ski!] It was a pleasure skiing with her." Logan was subsequently moved to the "mountain cruisers" class, where she rode the lifts and skied Greens and Blues. On Friday I saw Logan’s class on the Big Dipper (a challenging blue run.) Logan was doing great. I followed them down the East Peak lodge and joined them for lunch. Saturday Logan's instructor wrote, "Awesome job skiing blue runs and small bumps." Needless to say Logan had a blast and is ready for more next skiing next year. Two years ago, when Reagan was two, I dressed her up and put her on skis. This was exactly what I had done with Logan when she was two. Unlike Logan, Reagan looked at me like I was nuts. Reagan did an EXCELLENT job today!! We practiced stopping and made small turns on bigger slopes. Sadly, Reagan is less than enthusiastic. When I asked Reagan about skiing again, she said that she did not like the boots, the clothes or the snow. Of course I gave her the option of skiing or hanging with mom on Saturday. She chose skiing, so I don't think that she is a lost cause just yet. I am back from Vacation. There is a lot to report. So stay tuned this week. Sadly, and predictably I am way behind at work. I had 250 new unread emails when I arrived at work this morning. When I left work this evening, I had carved that number down to 160. So the Blog will be in the background until I get caught up. As I said the wait will be worth it. I have reports on the kids skiing, my race, and other stuff too like MARCH MADNESS!! So here is a quick running note. While in Tahoe, I managed to run four of the five days there. Not far mind you, but I logged six days running last week, which was excellent. Tonight I reported for duty at Norbuck for a 6x2:30 workout with Coach Vaughan. The rest of the group had the day off because last week was their final hill week. So it was just me and the coach. I had a good effort, and coach had nothing but great things to say. So we will mark that one in the log book and put it in the bank. Saturday I was down for 60 minutes, but McGehee had 80. Running the loop from McGehee's house meant that I would bail after five miles and loop back. This loop is actually more than 60, but what the heck, right? We were again slower this week. You can compare the mile splits with two weeks ago, when the accident happenned. I felt good, but my legs were dead from four weeks of hills. It turned out to be 66 which I logged as 9 miles. 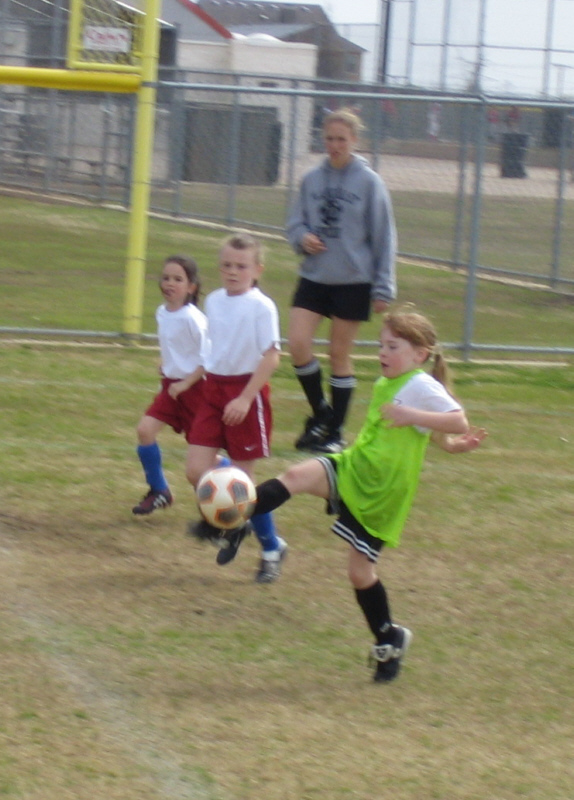 Then I went to help train Marissa's Soccer Team. I ran 3 more miles with them. That capped a 48 mile week. I'll be happy to have a light running load next week while I'm skiing in Tahoe! The official name of Marissa's team is Longhorns Navy 95. Today they played another Longhorns team, I think they are Longhorns North. This made cheering for the team a bit confusing. Longhorns North drew first blood coming on a play off a corner kick. Then they repeated the very same play to go up 0-2. Navy came back and with a nice attack to win a goal before the half. The second half was scoreless. Marissa had a nice attack where she divided two defenders but she lost the ball to a third defender close to the goal. The Terps continue to make it hard on themselves, by dropping their last three games. That makes Maryland the 8 seed in the ACC. They will play Clemson in the first game, a team which has handed them two losses this year. If they get by Clemson, then they face Carolina. Unless they beat Carolina, I don't think the Terps will make the dance. The Catamounts had two great games in the America East Tourney. Coppenwrath scored over 30 points in each game, after being named the America East player of the year. Vermont gets to host the championship game for the second year in a row. BU lost their first game, so the cats will play the winner of the Maine, Northeastern Game. Northeastern is the tougher team, but the Cats have beat them twice this year. The Cats have the one loss to Maine, but that was a gimmee, when Brennan decided to rest Coppenwrath and Sorrentine for the last regular season game with nothing on the line to play for. Sadly, I'll miss the championship game, as I'll be representing Remedy in the Celebrity Winterfest ski race! Yesterday I did some maintenance on the PCs around the house. I patched all of the OS's to bring them up to current standards. I cleaned up some of the crud on the drives, like deleting stuff in the temp folders. 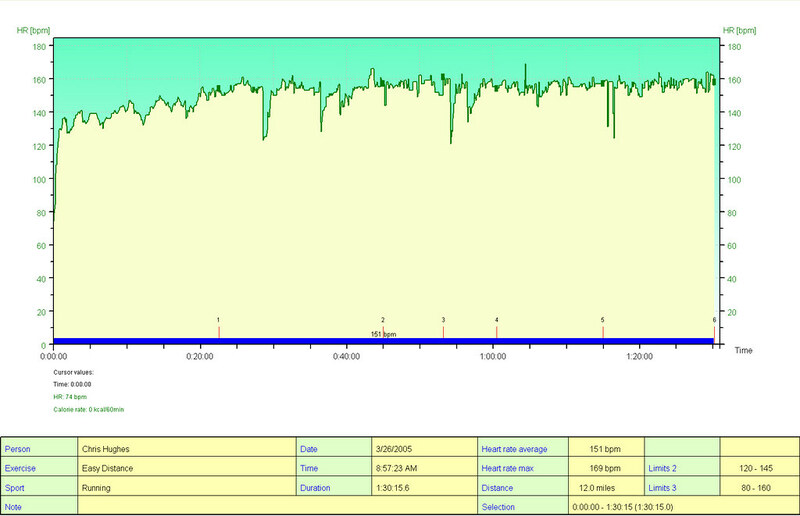 Then I ran defrag on the drives. I also installed the Microsoft AntiSpyware Beta. I have been getting some good reviews on the product. so I decided to install it on three machines yesterday. Thankfully they all came up clean! So I was happy. I had no problems with the product itself. You do have to validate your windows version before MS will allow you to DL the beta. That was not big deal for me. Joe Bob sez four stars, "check it out!" Today was the last hill workout. I improved on Monday's performance with a new personal best of 43.1!! Maybe there is hope for a sub 2:10 800 this year. Yesterday Fran called me in a panic. Marissa had to be at soccer practice at one end of town and Logan had a soccer game at the other end of town. But that was not what was bothering her. 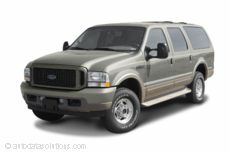 It was the oil that was pouring out of a hole on the bottom of the motor of the monstrous beast known as the Ford Excursion. Our version of the monster has a 7.3 liter turbo diesel truck engine built by International. Yesterday it was pouring oil all over the garage, driveway and alley. It holds 4 gallons, yes gallons, of oil by the way so it can make quite a mess! Fran told me that the tow truck driver, an alleged former diesel mechanic, thought it was the rear main seal. Replacing the rear main would require pulling the motor. Luckily it turned out to be a high pressure oil hose that had blown off. Thankfully that is a much smaller job!